Christy Callahan has been researching and writing in the integrative health care field for over five years, focusing on neuro-endocrinology. She has a Bachelor of Science degree in biology, earned credits toward a licensure in traditional Chinese medicine and is a certified Pilates and sport yoga instructor. Your knee is one of the largest working joints in your body, with several bones, ligaments and muscles moving together to allow you to walk, run and perform other tasks. Swelling in the knee often occurs with injury, such as in the ligaments, which hold the bones in place. Performing lunges and squats can strengthen many muscles in your legs, but they can also put pressure on various aspects of your knee, especially if done incorrectly. Four bones -- the femur, tibia, fibula and patella -- or your thigh, shin, outer leg bone and kneecap, respectively -- are part of your knee joint. The bones are separated with cushioning called cartilage, and attached to each other through a series of ligaments. Muscles like the quadriceps -- or front thigh muscles -- are attached to the bones via tendons. Your knee's motion includes pulling your lower leg up and back, bringing your calf muscle toward the back of your thigh, as well as straightening your leg. Lunges are exercises performed to strengthen specific muscles in your legs, including your quadriceps, buttocks and back thigh muscles, or hamstrings. 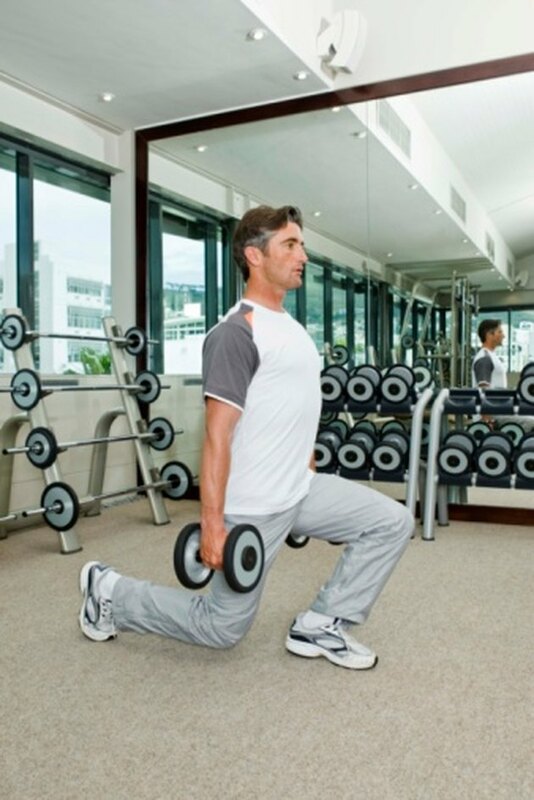 Benefits of lunges include leg strength and improved muscle tone, posture and balance. When performing a lunge, you step about 2 feet forward with one foot, bending both knees until the back knee is approximately 6 inches from the floor. Your back is kept straight and your front knee stays directly over your ankle until you return your front leg to the starting position. Improper form, too much weight and overuse can cause injuries in any muscle, ligament or tendon used to perform this exercise. Because you have a plethora of components in your knee joint, swelling after performing lunges can be a result of several potential injuries. Some of the most common injuries include patellofemoral pain syndrome, bursitis, tendinitis, meniscus tears or injured ligaments, explains Skylark Medical Clinic, located in Winnipeg, Manitoba, Canada. If your child or adolescent is experiencing knee swelling, it could be due to a growth plate injury. Overuse and improper form are two common reasons for knee joint aggravation. If you work out the same muscle groups too often, use too much weight or perform the movement incorrectly, you can cause mild or severe tears in muscles, ligaments or tendons and damage cartilage. If your knees swell after lunges, discontinue the exercise and seek medical help as well as guidance from a professional trainer. Your doctor will check your knee for injury and give you information to relay to a trainer that will allow you to work out without further injury. Rest your knee and apply cold or ice packs to help reduce swelling. Your doctor may also recommend a brace or wrapping your knee before you work out. Are Lunges Good for Strengthening the Knees?